From the galactic guardians of deep space to the street fighters of the concrete jungle, those granted amazing powers and abilities heed the call! It takes more than a cape and a costume to be a hero. It takes guts, determination, and the willingness to sacrifice. It takes even more to be a super hero. For with these amazing powers comes the responsibility to stand up to the greatest evils, protect the oppressed, and occasionally, save the world. The Savage Worlds Super Powers Companion contains new Edges and Hindrances, Setting Rules like Death & Defeat and Power Stunts, gear, rules for headquarters, a rogue's gallery of insidious villains, and of course a host of streamlined super powers ready for action. 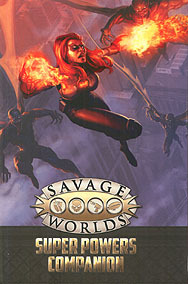 The Super Powers Companion Requires the Savage World core riles to play.